One day prior to the airing of the Say Yes to the Dress episode, Rebekah posted a photo of her and her exposed belly – she’s 38 weeks pregnant with her first child, a son she calls “J”. Rebekah met her husband, medical school student Jared Paster, on the dating app Bumble in 2016 and they were engaged nine months later. (Note: Rebekah is featured in a Bumble advertising campaign, see photo below.) 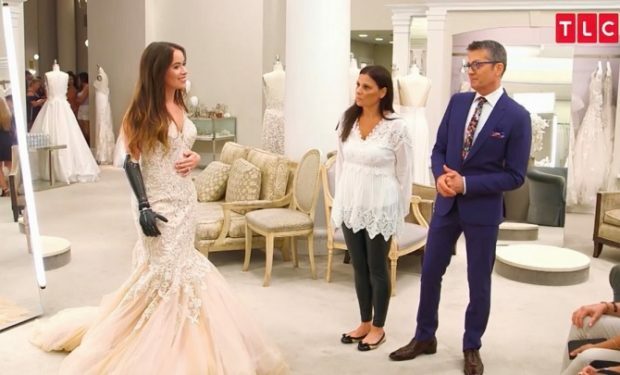 Say Yes to the Dress airs Saturdays at 8 pm on TLC. Happy 38 weeks, little man. We’ve come a long way! Weekly baby bump pictures are coming to an end soon, and your mommy and daddy are eagerly awaiting your official arrival. ⁣ ⁣ Your heartbeat rings in at a solid 140 bpm and your weight is, well, heavy, to say the least. ⁣ ⁣ Your mama gets very little sleep through the night with awful aches and pains, but knows this is just the beginning of a long, but TOTALLY worth it, journey with you. ⁣ Sweet baby J, we’re ready whenever you are.